The city of Litchfield is experiencing drainage problems on the entire South Side Ditch (400-acre drainage area) between State Street and McKinley Street in the southeastern quadrant of town. This area consists of inadequate rural drainage methods utilizi ng gravity flow through open ditches, filled-in ditches, under-sized roadway and driveway culvert pipes, and other field-constructed drainage structures in a very flat section of the City. The drainage area is mostly residential in nature, with some agricultural and park land as well. Heavy rain events in this region of the City cause significant ponding on both private property and public right-of-way, overflowing ditches, overtopping of streets, flash-flooding, and heavy concentrated flows through private property. Related problems consist of deterioration of roadways, erosion of ditch banks, and over-loading of the sanitary sewer collection system causing sewer back-ups into private residence basements. Improving the entire drainage area is cost prohibitive so HA has recommended that the project be phased in order to make the funding feasible. Currently HA is partnering with Litchfield and Illinois DCEO to assist with preliminary engineering and funding options. 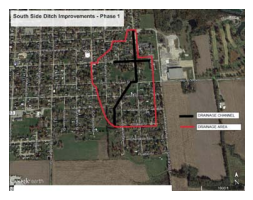 Final design is being completed on the first improvement phase, which covers about 75 acres of the eastern portion of the South Side Ditch. HA is evaluating existing conditions and analyzing feasible drainage system alternatives, recommending infrastructure improvements and related cost estimates, as well as construction plans. The first project phase will alleviate flooding by improving the flow of storm water runoff through and around the project area . 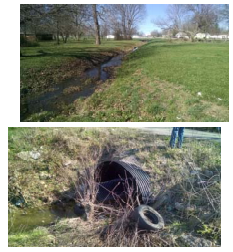 HA will assist the City with developing future phases of drainage improvements to maximize available outside funding. Litchfield authorized HA to utilize its funding ingenuity in an attempt to capture $450,000 of DCEO grant dollars for the first project phase, to complement local City funding (application is pending). /ditch improvements, roadway/driveway and sidewalk repair, and incidental utility relocation. The $600,000 project is a cooperative funding effort among Litchfield, Illinois DCEO, and HA. This is the first of several expected project phases in this region of the City, to improve the South Side Ditch drainage problems.